Wayne Community College’s energy camp, Camp Kilowatt, will return for its 10th year this summer. Norwayne Middle School, July 16-19. They will focus on STEM (science, technology, engineering and mathematics) projects such as propeller cars, battery cars, glider planes, and wind turbines. 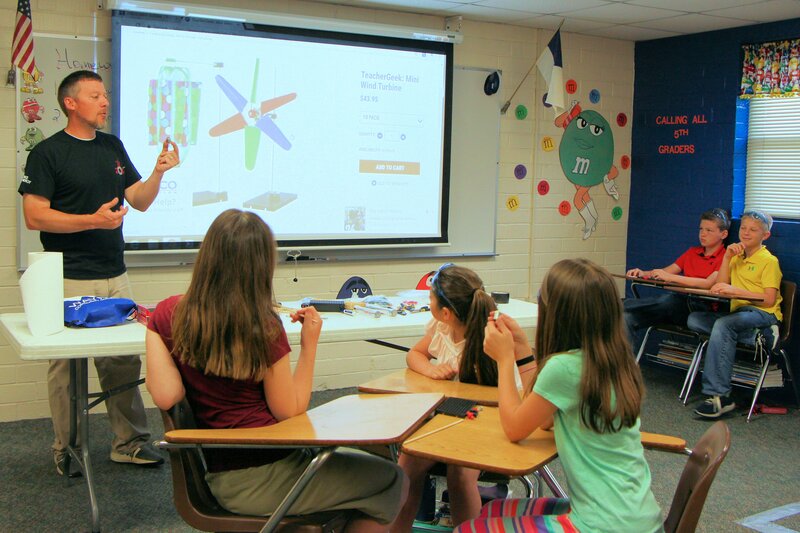 Camp Kilowatt Director Steven Reese explains how a wind turbines that fifth-grade students will build will generate electriity during a “mini camp” held at Faith Christian Academy last month. Around 120 Wayne County middle school students will be able to attend camps being held at their schools at no charge, thanks to the grant from Duke Energy. The grant is covering supplies, T-shirts, and two WCPS teachers plus an instructor from the community college to run each of the camps. The Camp Kilowatt session to be held on the college’s campus for rising fifth- through eighth-graders is scheduled for 9 a.m.-3 p.m., July 9-12. The dates for a camp for rising ninth- through 12th-graders will be announced later. Camp Kilowatt participants on the campus will explore STEM areas and work on projects similar to the projects that will be completed by those attending camps in community. The campus camps are limited to 40 participants each. Only a few spots are left so anyone interested in attending should sign up immediately. Registration forms and more information can be found at www.waynecc.edu/campkilowatt/. The fee is $125 and includes lunches and a T-shirt. If finances are a concern, contact Reese at srreese@waynecc.edu or (919) 739-6802 to inquire about scholarships. Mini camps that tackle a single project at a time are also being held at Faith Christian Academy. 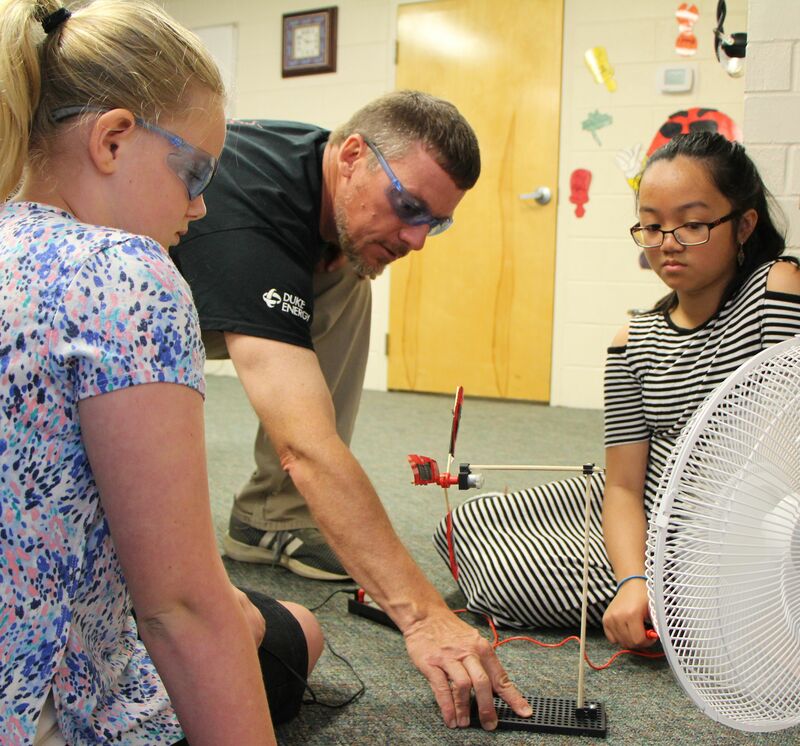 Camp Kilowatt Director Steven Reese helps Payten Taylor (left) and Laura Mai (right) find the right angle for their turbine blades to be turned by fan breeze during a “mini camp” held for Faith Christian Academy fifth graders in May. Camp Kilowatt is a product of WCC’s Applied Technologies Division and is financially supported by the Duke Energy Foundation. Wayne Community College encourages persons with disabilities to participate in its programs. Anyone who anticipates needing accommodation or has questions about access should contact the camp director.